The 2013 SRT Viper is the most talked about car at the 2012 New York International Auto Show and probably one of Chrysler's most talked about vehicles in a long time. The car was officially revealed yesterday at noon, showing the world it's sleek, serpant-like lines. Although seeing it on stage was pretty cool, we got an even closer look at last night's launch party. The first cars you see in the gallery are the SRT Viper GTS, the premium-packaged model, and the SRT Viper GTS-R, a non-street legal car that will be used in the American Le Mans series. 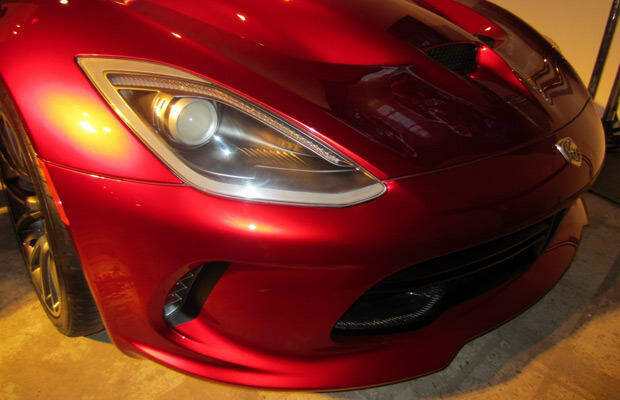 Word has it is that the basic SRT Viper will cost around $90,000 and the GTS will cost around $120,000. We made sure to get every angle. The following cars are the 1997 Dodge Viper Le Mans winner, and the original Dodge Viper concept. After that, we took some fascinating shots of the various art, drawing board concept designs, and specific parts that SRT had on display. Get to know the new super snake before you even hit the auto show with Complex's Highlights From the 2013 SRT Viper Launch Party.